You’ve invested in one of the Best CPAP Machines of 2018. To do it justice, and to make your investment worthwhile, you’ll now need one of the Best CPAP Masks of 2018 too. At the start, using a CPAP machine could feel a bit weird. Understandable really; you’ve got a small box humming away at the side of your bed, a long tube flopping around you and a mask on your face. It doesn’t sound like the recipe for good sleep. 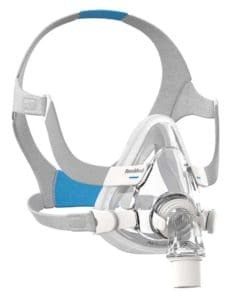 In time though, you will start to feel very relaxed with your CPAP machine and picking the right mask is a massive part of that. Size, fit and comfort are going to be vital. 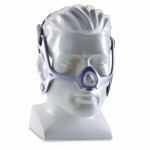 So if your treatment is specific, you need to pick a mask from the Best CPAP Masks list that compliments those needs. 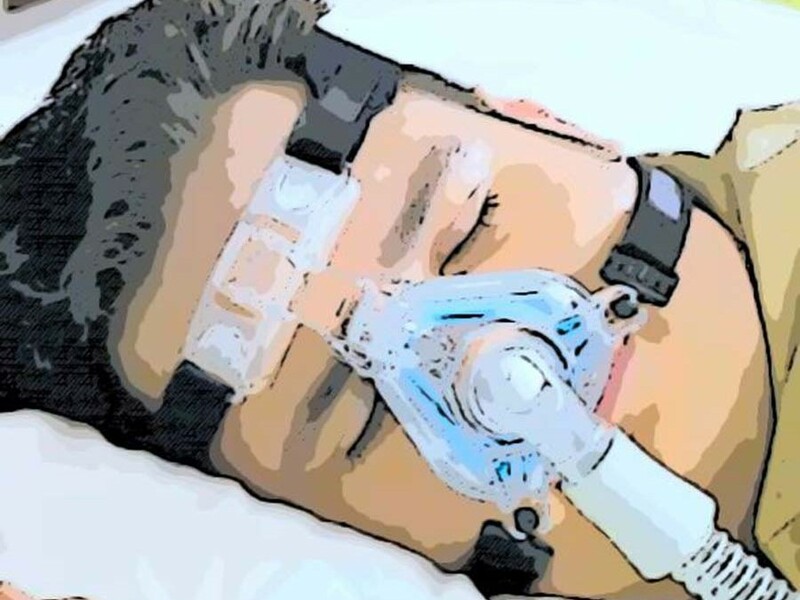 This list of the Best CPAP Masks of 2018 is going to be made up of the 3 main types of CPAP masks; the full-face mask, the nasal mask, and the nasal pillow mask. Nasal mask. As the name suggests, these cover just the nose. A good choice if you know you move around a lot in your sleep, or if you have some high-pressure settings as part of your treatment. Nasal pillow mask. This inserts a small prong inside the nose. Patients who feel a bit smothered by the full face mask may prefer this, or if you have a large amount of facial hair this is also a good option. 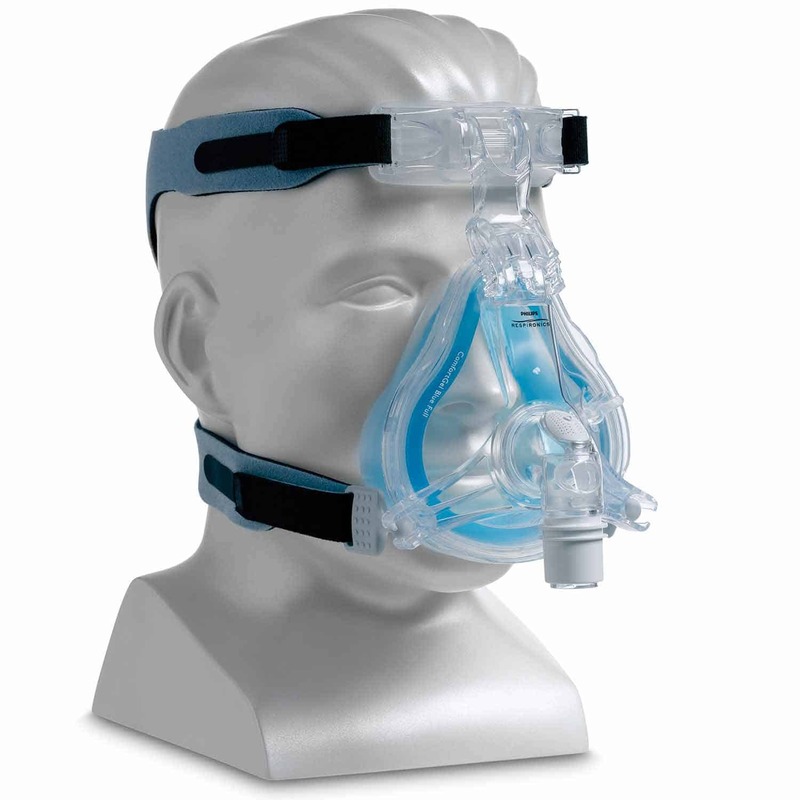 Like with your machine, it is important to maintain and look after your CPAP mask. You’ve invested in your sleep so you really want to make sure you get the very best treatment. At least once a week you should disassemble your mask and components to give them a thorough clean. If you buy a full-face mask you should be changing the cushions once a month, and on the nasal mask variations it should be every fortnight. As the name suggests, this is the fourth generation of full face mask made by one of the biggest names in the world of sleep apnea treatment, RedMed. Four generations of tweaking and development have resulted in a market leading CPAP Mask and one of the first names on our list of Best CPAP Masks of 2018. It fits nearly 100% of users thanks to its MicroFit dial, giving you an almost tailor-made CPAP mask. Unrivalled comfort AND fit; some masks are comfortable. Some fit well and provide great compliance. This does both. That MircoFit dial allows the wearer to adjust the mask with almost surgical accuracy. It also has their patented Mirage dual-wall cushion technology, meaning a great seal without the need to over-tighten the mask. A particular bonus is if you move a lot in your sleep; this thing is going nowhere. The vents reduce the chance of you doing a Darth Vader impression through the night and it is also one of the lightest and most slender full face masks that money can buy. Easy; all CPAP masks should have this, but sadly they don’t. Find your preferred fit and clip settings and you don’t ever need to change them. Many others need to be re-set as they get changed when you take them off of a morning. Not here. You find your settings and they stay in place regardless how many times you take it off and put it back on again. It delivers; you’ve bought a great CPAP machine and you want to ensure you get the optimal treatment from it. On all compliance tests, this mask scores very highly, you’ll struggle to find better. So you can turn out the lights knowing that you are receiving the full benefits of your CPAP treatment thanks to the brilliant RedMed Mirage Quattro. 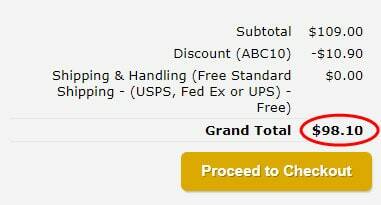 Built to last; you are buying a quality product here. A few years down the line it is very unlikely that bits start rattling and that straps start fraying. Consumers regularly comment on this product’s durability. The strap. Some prefer a more neutral or subtle color for their CPAP mask. This comes in a bold blue. But if that’s the only concern we have for this CPAP mask, you really shouldn’t be too worried either. The first name on our list of Best CPAP Masks of 2018 and rightly so. If you lean away from full face masks for comfort or claustrophobia reasons, that doesn’t need to be a concern with the ResMed Mirage Quattro. I found the cheapest place to buy it too! 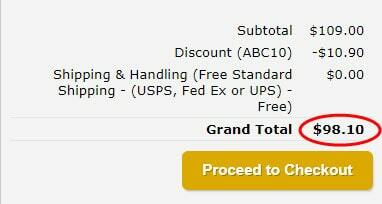 Click below and use this limited time discount code: “ABC10” in the “Shopping Cart” page for 10% off your total order no matter what you end up buying! Oh, that’s soft; it’s the first to feature the UltraSoft memory foam. So much like the dent in the couch that perfectly fits your backside thanks to years of sitting there, this will mold to your face in the same way. 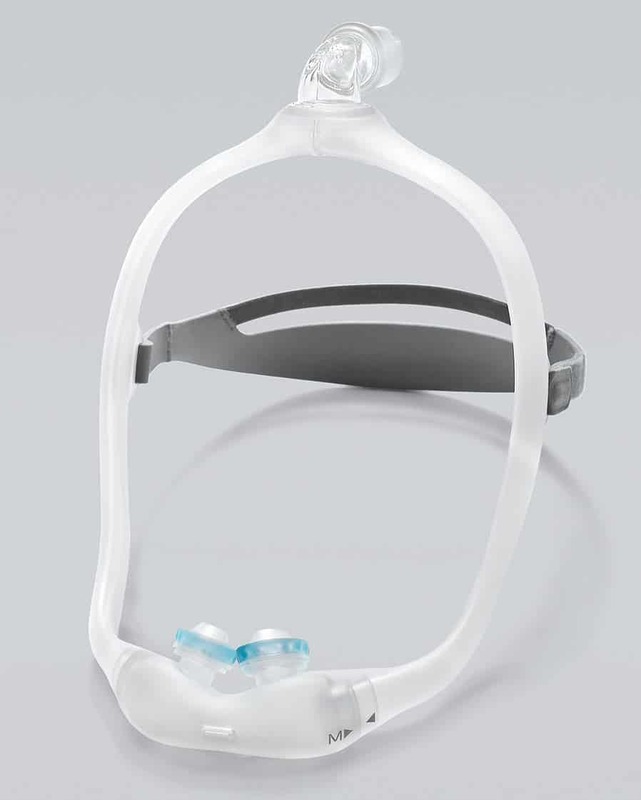 Easy on, easy off; you are able to disconnect the mask without removing the tubing thanks to the quick-release elbow. It also features some very useful magnetic clips which will guide the headgear into the frame. For her; the AirTouch F20 has a ‘for her’ mask to give all the features of the mask but designed for smaller facial features. It also has the option of a nice lavender color if that happens to be your thing. Guaranteed results; strange thing to flag up as a ‘negative’, we know that But if you are finding yourself leaning away from the full face mask as the idea makes you feel a bit smothered, this mask may highlight that feeling. However, tests have shown that you will be getting a very high level of compliance, maximizing the full impact of your lovely new CPAP machine. 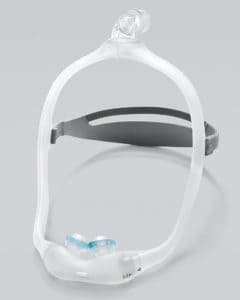 Another top of the range product from ResMed which is pretty much as comfortable as you could wish for. If you’re in the market for a full-face mask, you can’t go wrong with this one. If your research tells you that the nasal pillow mask is going to be the way for you to go, the should be first on your list to take a look at. Which is why it’s on our list of ResMed AirFit P10 Nasal Pillows System Best CPAP Masks of 2018. Free as a bird; if you’re not so keen on a full-face mask because you don’t want to feel smothered, you need to take a look at the AirFit P10. It is as discreet and compact as you could wish for! This also helps with the freedom to turn and roll in your sleep, if you know yourself to be a night-time gymnast. Reliable; in all tests, the P10 rates well in durability and reliance. Peace at last; advances in air diffusion means that you’ll be able to hear next to nothing from your mask. A real bonus for both you and your bed partner, because nobody wants to hear an impression of Bane from Batman when the lights go out. 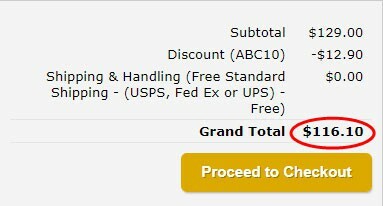 Compliance compromise? ; as with most non-full face masks, there is a risk of slightly reduced compliance; essentially less of what your CPAP machine is doing actually being delivered where it needs to go. However, you don’t have to make much of a compromise at all with the P10 as RedMed maintains their incredibly high standards. If you are going down the nasal pillow route, this is arguably the pick of the bunch. Great comfort and a great performance from an industry leading manufacturer. The first nasal mask on our list of Best CPAP Masks of 2018, and rightly so. Light, simple, and very effective. Feather-light the frame is ultra-light and ultra-soft. Users report forgetting you are wearing it, and there is no chance of those mask marks you sometimes get after a night’s sleep in other less quality masks. The soft cushioned and flexible support makes the mask one of the most comfortable nasal masks you could spend your money on. Which leads us on to the next point…. Price; we’re not sure how ResMed has managed to keep the price so low with such a great product. Simple design; there are only four parts to this mask meaning it’s a breeze to assemble and clean. It also features the useful quick release elbow so you can easily detach from the tubing without the need to remove everything. It’s still annoying having to get out of bed for the bathroom at 4am, but that’s annoying for anyone. Your CPAP mask won’t be adding to the problem! Silence would be golden; it’s definitely not loud, which is because ResMed knows what they’re doing. But if you’re looking at a nasal mask because your treatment involves some higher pressures, it won’t be as silent as some other mask variations. Having said that, for a nasal mask you are still looking at one of the quietest on the market. Top of the range nasal mask that will be one of the most comfortable things you’ve ever worn on your face. Phillips Respironics have really put in the time and research to create a brilliant full-face mask. When putting together our Best CPAP Masks of 2018 list, we knew this would be featured thanks to some fantastic user reviews. Comfort; the ComfortGel used in this mask is a gel to be jealous of. A different material to traditional full-face mask cushions, it will feel luxurious as it’s placed on your face each night. The gel cushion clips into the unique silicone comfort flap making this a great feeling mask as you sleep. Silicone flap; speaking of that silicone flap! The cushions clip into it and are protected by the flap making for less superficial damage over time. But it also helps create a brilliant seal so that you get the full benefits of your CPAP treatment. Up, up and away; the advanced diffusion of air means that this mask is a) very, very quiet. But also b) not going to be blowing air all over you or your partner as you sleep. Air is directed up and away from you rather than down. With other masks, some users become too aware of the air moving over their face. 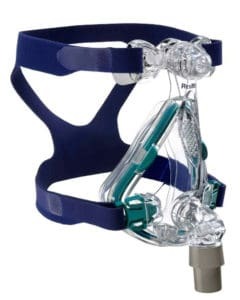 Not with the Respironics Comfort Blue full-face mask. Adjusts easily; the swivel base forehead creates a personalized fit, making for great comfort through the night. The CPAP elbow has a full 360-degrees range of movement meaning you can move around in the night almost unrestricted. It also has quick release tabs so you can easily disconnect in the middle of the night without needed to put the full head gear back on when you come back. More colors? ; it’s very blue. Some users would like to see it in other colors. But let’s be honest, when the lights are out who really cares anyway!? If you want great compliance and fit but don’t quite want to spend as much as a market leader, like the ResMed Mirage Quattro, you can’t go wrong here. A great full-face mask and no surprise to see it on our list of Best CPAP Masks of 2018. Utilizing the comfort gel of their full-face mask, the Respironics DreamWear provides awesome comfort and a really clever design feature to assist even the most active of sleepers. Top thinking; straight out, what you’ll notice is that the tubing connects to the mask at the top of the head. So rather than having the tubing at the front of your face, you’re going to be almost oblivious to it. For a lot of people, this is a real plus point. Not just because it allows you unbelievable freedom in your sleep but because it makes you feel much freer and a lot less smothered. This is something which you would struggle to get from a full-face mask. So if you are put off by full-face masks as you might feel a bit claustrophobic, you’ll love this feature of the DreamWear. The tubing also swivels in its connector adding to your range of movement. You’ll forget it’s there; as well as the head connector, the mask is so lightweight and flexible you’ll start to forget you’re wearing it in no time at all. A great ‘skinny’ design reduces facial soreness and you’ll have a full field of vision. So you’re free to read, watch TV, or flick through your phone. Doing your machine justice? ; if you don’t go for a full-face mask you may have to concede a bit of efficiency in the treatment. This is still an incredible mask for compliance though, so if your treatment needs aren’t too specific or needing to be 100% precise you will have no issues at all. It still provides great results even for a non-full face mask. One of the least intrusive and restrictive CPAP masks your money can buy! Comfort and design are top end to allow for a peaceful and unhindered night of sleep. 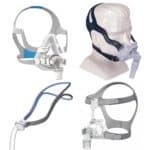 When it comes to choosing an effective sleep apnea machine mask that will work in treating your sleep apnea disorder, there are many things to consider. These include finding a mask that has the right specifications and features for your specific disorder and your specific needs. 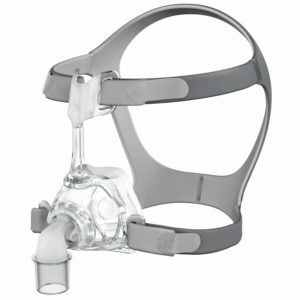 When looking to find the best CPAP mask for you, these best CPAP masks in the list above will no do you wrong. The above top 6 CPAP masks cover the entire spectrum of sleep apnea disorders and patient preferences. You’ll find out Ultimate Guide to sleep apnea here. Any questions or comments? Write to us down below in the comments. Happy Sleeping from Cara Gilmore and the SnoringABC Team! Enter for a chance to win a Free SoClean 2 CPAP/BIPAP Cleaner and Sanitizing machine ($299 Value)! 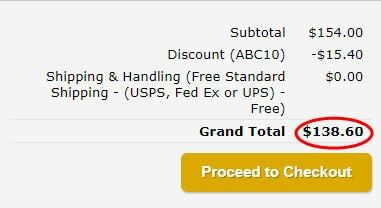 Do not forget to confirm in your email inbox in order to enter the raffle! Are there any full face masks that don’t have the headge that goes around the neck? I get bad tension then on to a migraine with the gear around my neck. Are there any full face mask that DO NOT have the headgear that lies at the edge of the neck? I suffer from tension and this is very uncomfortable for me. I am not aware of full face masks that don’t have a strap that wraps around the bottom of the head. Here is a review on youtube of the PadACheek anti leak strap that helps adjust the pressure from the bottom strap to the top of the head. This may be what you are looking for. Please let me know if this helps. To be honest I haven’t heard much of anything on either side regarding the Amara View full face mask but you are welcome to try it and can always return it I guess. Have you tried the Mirage Quattro full face mask? I know you don’t like the full face mask you tried, but many people have found this one to work very well. The Amara View full face mask is the best one I have used. The Quatro would leak and wake me up when I moved. The Amara is lightweight and really works for me , I am a side sleeper and it stays tight. I used a Nasal, the Nuance is the best I have tried but since I am a mouth breather I needed to find a full face type mask. The Nuance works great if I tape my mouth, but when I have congestion the Amara View is awesome. I use the Amara Gel. It works awesome. Be sure to request gel version as plastic cushion on standard version is awful. For years I never had a problem with air leakage and always used the Respironics Comfort Classic with a contoured concave cushion. This mask is no longer available and since then I have always had problems with air leakage from several different masks. The ResMed gel pad which fits over the nose first is useless. Do you have any knowledge of a mask with a concave cushion similar to the old Comfort Classic? 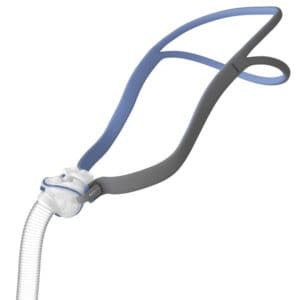 I am currently using the ResMed AirFit P10 Nasal Pillows System and like it a lot, but I have trouble with the straps stretching and sliding causing the nasal pillows to not stay put. Does anyone have a solution on what can be done to keep the straps in place? Best BiPAP Machines of 2018 – See the Top 6 Today!